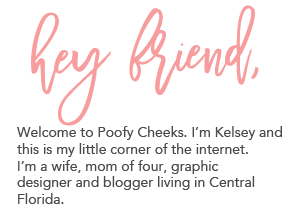 The best part about our new rental is that my craft room is in the brightest room of the house meaning I can also do my blog pictures in there too! In our old house my craft room had NO windows and I always had to relocate for pictures dragging my craft mess all around the house with me. My craft room is what would traditionally be a dining room, but we are not traditional. My family is perfectly content eating in the breakfast nook area, and I rarely have enough company to need a bigger table. With that being said, you can see everything in my craft room from the living room, so I had to skip the girly colors and make sure everything had a spot and stays organized. Now I’m going to let you in on a secret… this is what the room liked like the week we got the keys. Here is what it looks like from the same angle now. I turned a tablecloth into curtains, made a few changes to my sawhorse desk and hung my mason jar shelves. My dad hung my huge computer screen and then I made my final touches. Wow. I wish I had the space to do this! This is beautiful. 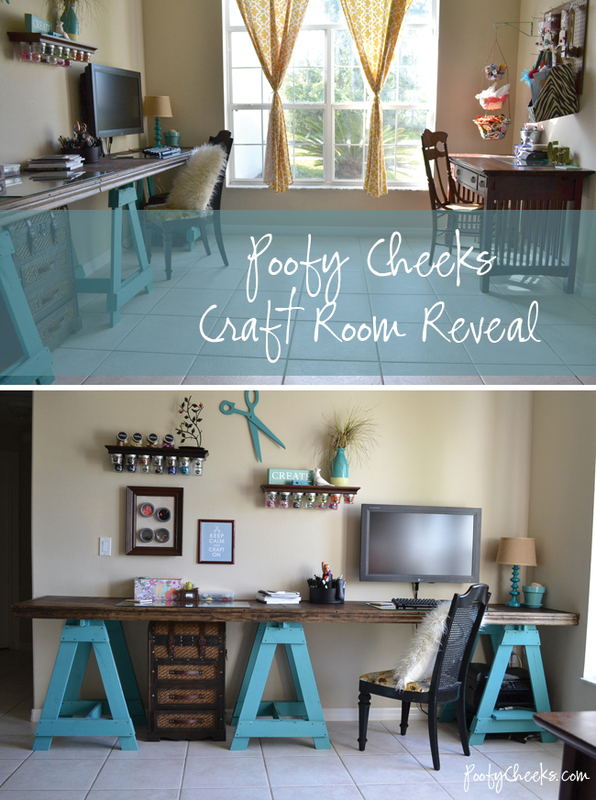 I would have to say it looks more like a office/study then a craft room. Love the saw horses. What a little paint can do….. This looks very nice. Did you ever consider hanging some really nice sliding curtains across the columns? You could then claim some of the space behind the longer section as a "wall" and put some more storage or open shelving there. In the middle section, that could be your "door" and you could close it if you are in the middle of creating and haven't had time to clean up. Also, you could pull them all over to reopen the area when you feel like it. Just a thought. I like to use all my area – I am packed in my small bedroom, but it's fun and I feel like I'm in a really creative space. Wow- great space. 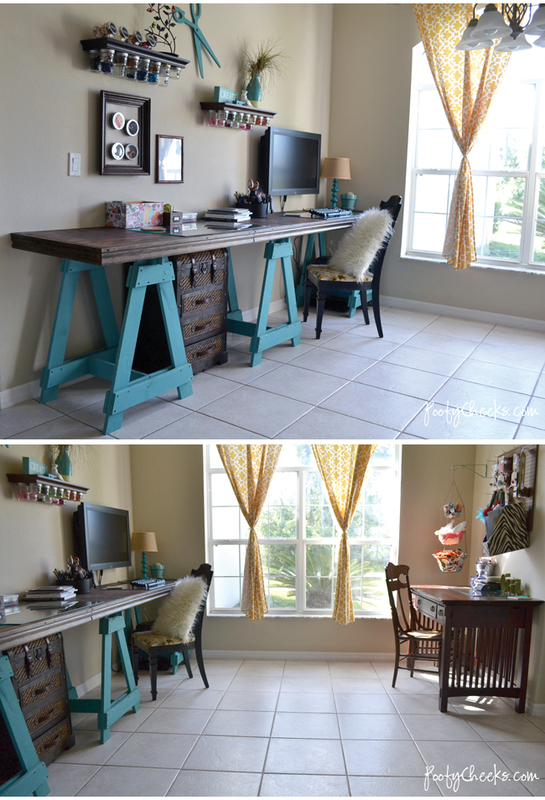 I love that desk… the blue with the rustic top looks amazing together! Super cute! I love the colors!!! !!!! I am in love. My man and I are moving into a new place this coming summer after he gets back from deployment and my crafting space is a big concern for both of us. He's handy with tools and even makes furniture, so I have to show him this! I really like how well the turquoise blue and dark wood stain compliment each other. The molding around the edge of the desk was a great addition. Nice work!